The Westwood S1300H hydrostatic 36 ride on lawn mower with its Hydrostatic transmission, gives this model the great advantage of a great deal variable speed control via a simple foot pedal. With its 12.5hp 4-stroke I/C Briggs and Stratton electric start engine, it makes it powerful enough to tackle surface. The mower will deal with the finest lawn, or the most uneven orchard and paddock environment, with its floating cutter deck that follows the contours of rough ground. It has a grass cutting width of 92cm (36in) with a triple bladed. 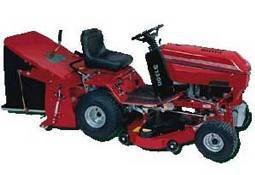 The grass cutting height is between 12-101mm, in adjustable 10 positions, with rear discharge. It has electromagnetic clutched blade engagement and a hydrostatic transmission with a maximum speed 5.3mph. The engine compartment is shielded with a double lined plastic bonnet to reduce engine noise levels. Comfortable to ride with its well padded adjustable seat, the unit has a Power Take Off for running useful powered accessories for chipping, shredding, scarifying and spreading etc. Overall width of this mower is approximately 37in/94cm with a weight of 260kg. You can be the first to write a review of the Westwood S1300H Hydrostatic 36 Lawnmower. Send a review. Please help us to help our visitors by sharing your views on the Westwood S1300H Hydrostatic 36 Lawnmower.Please post a fair review and try to make your review balanced featuring good and bad points. All Lawnmower reviews submitted will be reviewed for suitability. If you know of a cheaper price elsewhere please let us know. If you are a Lawnmower retailer and sell this make and model of Lawnmower and would like to be listed here please contact us. Important note: Please note that all pricing information is provided in good faith. We accept no liability for incorrect pricing and all prices are checked regularly for accuracy. This service is provided for the benefit of visitors to this website and this information may not be copied under any circumstances.